The drums of war have begun to sound, echoing through the jungle as masked savages crash through the undergrowth seeking out a new village ready for pillaging of its valuable resources. Jungle Wars allows players to be the chieftain of one such village, your job is to improve your lands and protect them from enemy hostiles or field your very own masked soldiers and bring a savage end to rival villages yourself. The game is free to play through any web browser and does not require a client download to access. 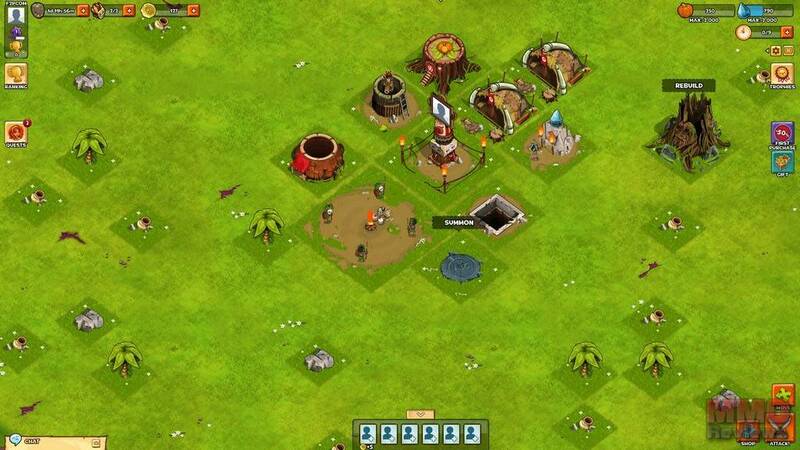 The core gameplay of Jungle Wars revolves around constructing your own base, which you must then defend whilst at the same time raising troops to attack enemy villages as a primary source of resources. Players must manage these resources, keeping them replenished as they are used in all elements of unit acquisition, building construction and upgrades, as well as managing their own time with each build using up the limited number of Workers and taking minutes and even hours to finish construction. For many players the end game content focuses primarily on PVP and acquiring a high PVP rank, which in turn will reward players with the coins Premium Currency. Players are able to focus on the PVE campaign, working their way through the quests and tackling the AI villages, which will yield resources as well as allowing players to keep their Shield that prevents players from attacking their own village, similarly by not attacking players a village is less likely to come under assault from a revenge attack. However, for those that enjoy PVP and climbing the ranks players have the chance to attack other players villages and test out their defences, trying to steal their resources and earn rank and position in the community, either as solo fighters or within a Clan, which will in turn yield great rewards for the top players.